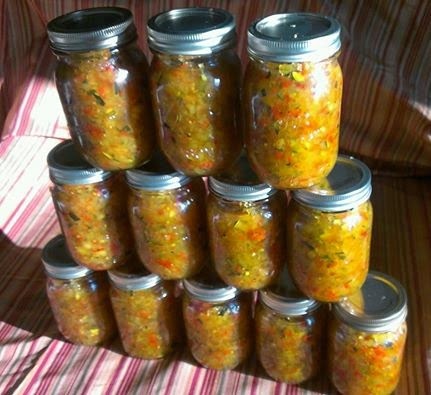 Recipes To Write Home About: Zucchini Relish with a kick! Zucchini Relish with a kick! Coarsely chop raw vegetables and pulse them through a food processer until they are about the right size for relish. Measure the vegetables at this point for the recipe. Put the vegies into a large plastic container and add the salt. Mix the salt in. Cover with plastic wrap and let the mixture stand over night. Before you start any other prep work, put 6 or 7 pint mason jars, 6 or 7 rings, and 6 or 7 lids into your dishwasher on the hottest setting and allow the dishwasher to run when you are working. Start a big pot of water to boil to process the relish. Put the vegetables into a colander and rinse with fresh water. Press out most of the water. 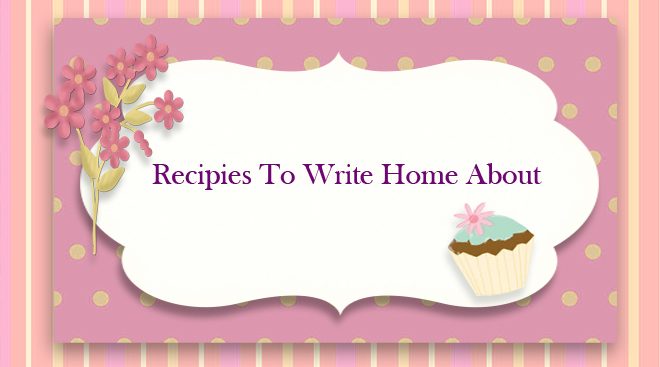 You will have to do this in several batches. Set the vegetables aside for a few moments. Put all of the ingredients for the spice/vinegar mix in a pot and bring to a full boil. Add all of the vegetables and bring to a boil again. Boil for about 10-15 minutes. Ladle the hot relish into the hot jars, leaving about 1/2 inch of head space. Wipe off the rims with a moist paper towel. Cover the jars with lids and tighten the rings down. Put the full jars into a big pot of water and make sure that all of the jars are covered with at least on inch of boiling water. Put the lid on the pot and allow the jars to remain in the boiling water for 10 minutes. Remove the jars and put them on the counter. You will hear several pops in the next few minutes as the jars seal. Any jar that has not sealed after about an hour should be put in the refrigerator and used up in a month or two. This recipe will make about 6 pints or relish. You can easily double or triple the recipe. One monster zucchini will make about 6 pints of relish. It has a great flavor and is crispy. I am not going to tell anyone that it is a zucchini relish. I am going to call it Garden Relish and let that fly. It honestly tastes a little better than regular cucumber pickle relish. I just ate a cracker topped with cream cheese and relish. Delicious!